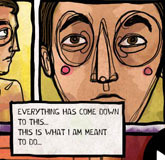 Includes 3 short interactive and animated comics based on the story of Olympic diver Greg Louganis. 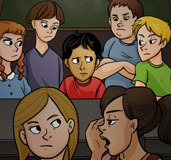 In this comic Greg experiences bullying from his peers because of his dyslexia and his race. His peers bully him because Greg is different in both appearance and how he understands the world around him. Prepare for and participate effectively in a range of conversations and collaborations with diverse partners, building on others' ideas and expressing their own clear and persuasively. Kendall College of Art and Design of Ferris State University faculty and students performed extensive research to create this media as part of the EPIC project. The Development (coding) for the Fast Food Frenzy game was powered by the the KCAD Framework created by Digital Concierge.